Chipotle Chicken Waffle Sliders were created by our own chefs given the current popularity of slider burgers. Savoury waffles form the buns while super crispy chicken medallions take position in the center, topped off with UFS chipotle sauce. See the full recipe below! Add water to eggs and scramble. Coat chicken patty in flour mix then egg mix & finally into bread crumbs before frying at 170°C for 3 minutes. Place the flour, sugar, baking powder, paprika, Knorr Chicken Stock Powder and pepper in a large mixing bowl. Mix well. In a second bowl, whisk the milk, butter and eggs. Make a well in the dry mix, and pour the wet mix into it gradually, whisking until fully blended and smooth. Whisk in the garlic purée and cheese until well combined. Once the waffle maker is hot, pour a ladleful (approx. 50ml) into the center of each grid. When the waffles are baked to your liking (this should take around 3-4 minutes, depending on your preference), carefully open the lid and remove from the waffle maker. Keep the cooked waffles warm in the oven at about 140°C on a wire rack. 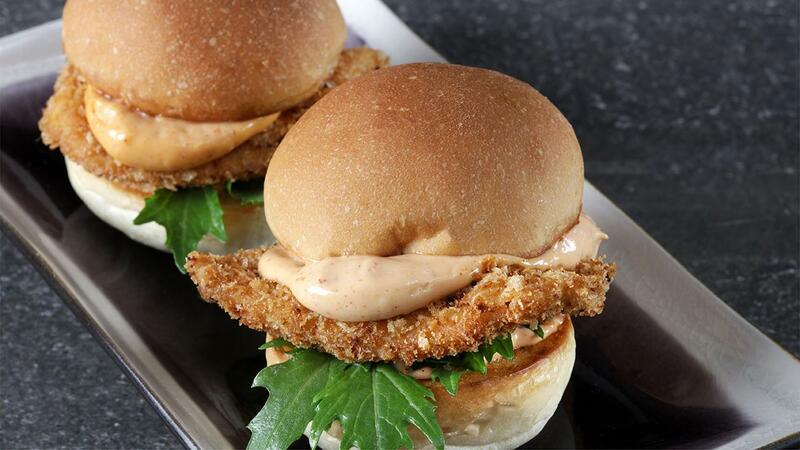 Layer the sliders with the chicken in the center, sauce on top and underneath and salad leaves. Close up with mini waffles and serve. Leave the waffle batter to rest for 5 min before baking.